The reason why this post is under the “Business” tab is because: 1) I had nowhere else to put it, and 2) because politics is a form of business on its own. For my foreign readers, I apologize about this post, but maybe you will get something out of this. For those who don’t know, Alberta is the economic engine of the oil-driven Canadian economy. The province has the third largest reserves of crude oil in the world (behind Saudi Arabia and Venezuela) and is expected to produce nearly 3.8 million barrels of oil per day by 2022. If you haven’t heard much about the “Alberta’s oil sands” yet, then click here. 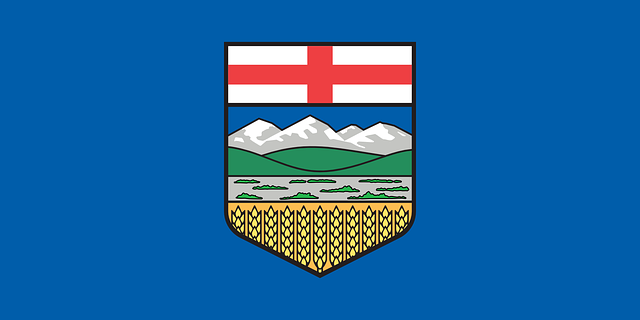 The province of Alberta’s official flag. However, that’s not all. Alberta has the fourth largest population in Canada (just over 4.1 million people), has the second highest GDP per capita in the country ($84,390), and is the home to the city with the second most businesses’ headquarters in Canada, Calgary. On May 5th of 2015 Alberta had its 29th general provincial elections, where the New Democratic Party took down the the Progressive Conservatives who had been in power for the past 44 years. Quite the feat to say the least. This time around we had an amazing number of voters take their opinions to the ballots, amounting to the highest turnout in 22 years. Out of 2,543,127 possible voters, 1,481,477 voted (58.25%). It is not where we would like it to be yet, but it’s a huge step in the political scene of Alberta. Living in Alberta for the past 7 years, I’ve noticed that politics isn’t much of a conversation topic at the dinner table. Growing up in Brazil, politics account for nearly 100% of the conversation in any given day (mostly due to corruption scandals, however). I still have my doubts about how much that was due to the Netflix hit series “House of Cards”, but so be it. So, here we are today, May 6th, looking at a somewhat unknown future for ourselves as Albertans. Over the past few months we could read a lot about what each party was going to offer (click here for more) if they were elected on May 5th. And, as of the past week we could see an unmeasurable amount of party signs on our lawns everywhere we went. It all came down to a battle between two parties, really, the Progressive Conservatives (PC) vs the New Democratic Party (NDP). Below you can watch a 30 minute condensed debate held on April 23rd of 2015 between the PC, NDP, the Wildrose, and the Liberal parties. It is easy to see that the Wildrose party was on the defensive the whole time – “we will not increase income taxes” – and the Liberal party was trying to squeeze in an argument here and there from time to time. The show really went down between Jim Prentice (PC) and Rachel Notley (NDP), who were both on the offensive throughout the program. protecting jobs and getting off the boom/bust oil field cycle. improving healthcare, education, and job creation within a fair revenue creation system. Once the NDP was announced winner of the 2015 election many people took their opinions to the social media platforms claiming that now we are all doomed. Maybe NDP’s idea of increasing corporate taxes by 20% (from 10% to 12%) in a time of economic crisis is a bold movement, but so was the PC’s budgetary cuts in healthcare and education in April to compensate for the province’s deficit. Having election in times like these is always though, because each person has their own concerns about what should be fixed and what should be left untouched, but the matter of the fact is that politics’ issues go way beyond what an average person could comprehend. If you put money here, something has got to give there – there is a lot at stake and a lot of people to look after. No politician will ever be able to make everyone happy. What political parties intend to do is to propose their ideas to solve a problem. Each one has their own set of solutions, and as Albertans we had to bet our money on one of them. I believe that change is always good, especially one that hasn’t happened in over 40 years. I understand that what gives Alberta an edge over the rest of the world is our low corporate taxes, what attracts capital investment making of us a free enterprise province. But I also understand that we need to look at the long run. We need higher investment in education and healthcare. We cannot allow our governments to take money out of those sectors because they are what make society progress. The business environment is changing and we are in a higher need of educated workers in the market than ever before (that is why the federal and provincial governments have so many programs in place to attract qualified immigrants to Canada). And we also need to reduce waiting times at the E.R. without privatizing our healthcare system – because in the end of the day we need our people alive. Can we expect the NDP government to set up stricter environmental rules to the oil companies? Yes. Can we also expect the NDP government to create over 27,000 jobs? Yes. That is what Rachel Notley preached during her campaign, and now as Albertans our duty is to help the province continue to move forward. Will the NDP make mistakes along the way? Of course. But we should trust our leadership and work with them to help make Alberta’s vision of progressing into a role-model province become a reality. There is no reason to complain if you didn’t vote NDP, quite yet. And there’s is no reason to celebrate if you voted NDP quite yet, either. Born and raised in Brazil until the age of 16. Moved to Canada as an exchange student and played basketball for Red Deer College. On third year of school transferred to the University of Calgary where he attained his B.Comm in Entrepreneurship and Innovation. Today, he works in business and writes about insights and knowledge acquired throughout his life.